Sony India has launched the new portable high power audio system MHC-V21D. Sony MHC-V21D is powerful one box system and is designed for clear, dynamic sound, and it provides wireless Bluetooth capabilities. This portable system has built-in carry handle bar allowing it to be easily move around. The cylindrical design of the system fills the room with powerful thumping sound. Its angled tweeter units spread sound wider, so everyone can feel the same body-rocking beats. MHC-V21D features attractive lights transforming any space into a dance floor by illuminating lights, giving a club-style atmosphere in a room. The MHC-V21D offers Near Field Communication (NFC) and Bluetooth technology. The user can simply touch the NFC-enabled device to the MHC-V21D for a quick, seamless connection and can start streaming the music collection. The LDAC helps to send approximately three times more data than conventional Bluetooth audio for a superior wireless listening experience as claimed by Sony. The system is equipped with HDMI output which enables the user to watch any movie or show on their normal screen while enjoying huge sound from this powerful speaker. It has built-in DVD player which enables users to watch movies easily, and experience rich sound that brings scenes to life. To elevate the experience one can customize playlists with direct CD-to-USB recording and play tracks stored on a USB device. Simply connect the device to the PLAY/REC port and one is set to power up the next party with all their favorite tracks. The MHC-V21D is equipped with DJ effects which allow one to put their own spin on music tracks. The audio system comes with four different effects which set the stage for any party: ‘Flanger’ creates a deep flanging effect similar to the roar of a jet plane, ‘WAH’ automatically moves the frequency of a filter up and down, ‘Isolator’ singles out a specific frequency band, and ‘PAN’ sweeps the sound across speakers. One can further use DJ effects with the Fiestable app to easily control party features like DJ Control, DJ effect (Isolator/Flanger/Wah/Pan), Sampler (Drums/Voice/etc.) and EQ. Users can also enjoy Motion control feature which allows them to control their system with just a motion of their smartphones. 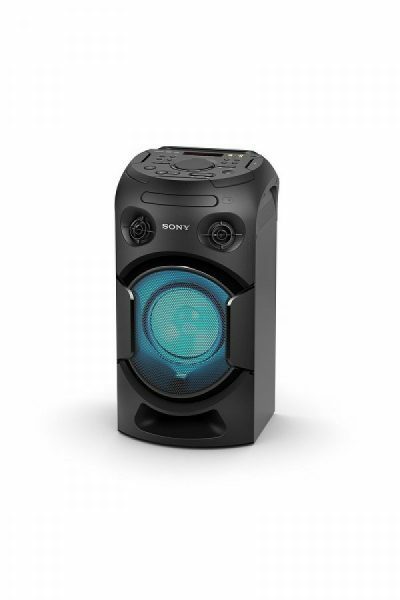 DJ effects, play/pause and volume options can all be handled by motion control function. The audio system is also enabled with Digital Sound Enhancement Engine (DSEE) which helps boost the quality of any compressed music files. It has two mic inputs and user can go head-to-head singing along to user’s favourite tunes with their guest. The Music Center app lets one control music and sound settings right from the phone. The Fiestable plug in puts the user in charge of light colours and enables one to activate DJ and karaoke modes. This system enables you to harmonize sound with the Wireless Party Chain via Bluetooth feature that connects up to 50 compatible speakers and synchronise music and lighting. The MHC-V21D is priced Rs. 18,990 and is available in all Sony Center, major electronic stores across India and on e-portals, Amazon and Flipkart. Sony is bundling MHC-V21D with Sony Microphone, F-V120 as a special offer. This offer will be valid only for a limited period of time available across India.